Two Colours / Three Dimensions is a fun short animation with a playful approach to anaglyph colors and retinal rivalry. KLIK!, an animation festival based in Amsterdam, is accepting 3D animated shorts. See the press release below for info on how to enter. Deadline is July 1st! This is a call to all 3-D stereoscopic animators! Nowadays visual media, especially film, cannot be imagined without the extensive use of stereoscopy. While the 3-D revolution advances further in every field, the (independent) animated short in particular keeps utilizing the technique in an innovative way, exploring its influence on and place in a films' narrative. The KLIK! Amsterdam Animation Festival has been following the evolution of stereoscopy with great interest and introduced a 3-D Stereoscopic Animation Competition to their international animation competition last year. 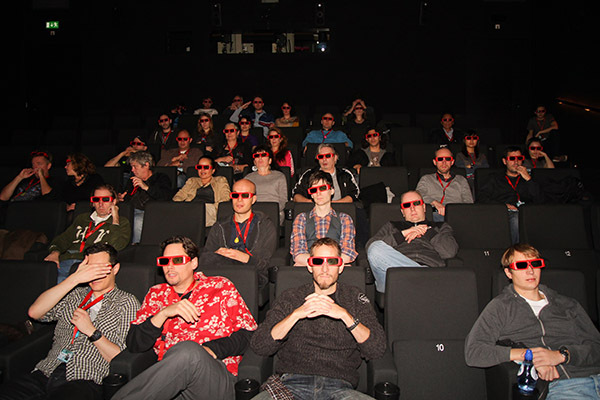 The competition turned out to be a great success, leaving the audience in awe of the value that stereoscopy can add to a story. This year the KLIK! Amsterdam Animation Festival proudly organizes the 3-D Stereoscopic Animation Competition for the second time. Among other competitions, the 3-D Stereoscopic Animation Competition for the KLIK! Amsterdam Animation Festival 2013 is accepting submissions until July 1st. So don’t forget to submit your newest 3-D stereoscopic animated short before it’s too late! Submitting is free. You can submit your animation either by sending a Blu-ray by old-fashioned mail or by e-mailing a plain simple (3-D!) YouTube/Vimeo link. A submission’s running time shouldn’t exceed 25 minutes and it has to be produced later than January 1st, 2012. Aside from the 3-D category you submit to, your entry will also automatically compete for the KLIK! Amsterdam Audience Award. Oh, and don’t forget to make your envelope a piece of art for a shot at the Most Awesome Envelope Award! After submitting you can start crossing your fingers, until the official selection gets published in August. The KLIK! Amsterdam Animation Festival is an annual animation festival that will be celebrating its sixth edition this year in EYE, the new filmmuseum, in Amsterdam, Holland. The greatest and latest animation will be accompanied by a wide variety of masterclasses, theme programs, parties and activities. Last year’s international animation competition received over 1200 submissions from 71 different countries.